We are actively engaged in manufacturing an extensive range of Hydraulic Riveting Machine for catering the diversified requirements of our clients. The Portable hydraulic riveting machine is mainly used in all kinds of industry for riveting & pressing etc. Applications - Automobiles & Automobile component manufacturers. Product Description:We have marked a distinct and dynamic position in the market by providing a quality assured array of Press Machine. As the leading manufacturers and suppliers of special purpose machines, we bring forth to our Automatic Hydraulic Riveting Machine containing inbuilt power pack at low cost of maintenance. Rigid construction, precise depth and force controls, rivet head height readout are just some of the features that come in our riveting presses. We have supplied these Hydraulic Riveting Presses in the automobile and heavy steel structure riveting applications. As easy solution with less time for Riveting functions of Handle, body and Bracket. The Hydraulic function to Riveting produce the equal strength for better grip to the handle and bracket. The machine is designed fro all type and size of cooker, Utensils and kitchenware items. Our Hydraulic Riveting Machines are in high demand are fabricated using sophisticated machinery and innovative techniques. 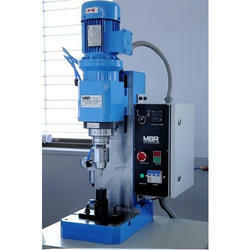 These Hydraulic Riveting Machines are high in performance, corrosion resistant, durable and flawless. Our Hydraulic Riveting Machines are in high demand are fabricated using sophisticated machinery and innovative techniques. An easy and better solution with less time for every riveting function of handle, side handle and brackets. The hydraulic function with adjustable pressure for riveting job produce the constant strength for better result of griping the handle and bracket. Hydraulic riveting machine is specially designed for all types and sizes of pressure cooker, utensils and kitchenware products. As easy solution with less time for Riveting functinos of Handle, body and Bracket. The Hydraulic function fo Riveting produce the equal strength for better grip fo the handle and bracket. The machine is designed fro all type and size of cooker, Utensils and kitchenware items.